Acquired: Originally drafted in the fourth round (27th overall) in the 2007 CFL Draft. Contract extended on Feb 11, 2018. 2018: In 18 games (18 starts), McCarty finished with 14 receptions for 110 yards, one carry for four yards and six special teams tackles. 2017: In 18 games, (18 starts), McCarty finished with for 56 rushing yards on 13 rushes and has 22 receptions for 143 yards and one touchdown in 18 games played as well as three special teams tackles. In the West Semi-Final, McCarty caught one pass for seven yards. McCarty also appeared in the West Final. 2016: In 11 games (11 starts) McCarty had 11 receptions for 79 yards, 15 rushes for 59 yards and two touchdowns. He also added three special teams tackles. Went on the 6-game injured list in Week 13. Activated to the active roster for the Eastern Final against Ottawa. 2015: In 12 games (12 starts), McCarty had one carry for 20 yards, nine receptions for 68 yards, five special teams tackles and one kick return for 17 yards. He also had a forced fumble in Week 4 against Ottawa. Went on the 6-game injured list in Week 12. Returned to the active roster in Week 18. McCarty played in the West Final and had one special teams tackle. 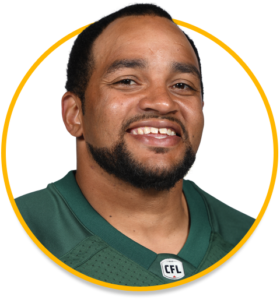 In the Grey Cup, McCarty rushed once for three yards on a fake punt. 2014: In 18 games (18 starts), McCarty recorded 16 catches for 123 yards and two touchdowns. He also recorded eight rushes for 37 yards, as well as 11 special teams tackles and one kickoff return for two yards. In the West Semi-Final against Saskatchewan, McCarty recorded two catches for 19 yards and two special teams tackles. In the West Final against Calgary, he recorded one catch for six yards and two special teams tackles. 2013: In 18 games, McCarty recorded 20 catches for 186 yards with two touchdowns, nine rushes for 48 yards and nine special teams tackles. 2012: In 12 games, McCarty recorded 12 rushes for 36 yards with one touchdown and five receptions out of the backfield for 23 yards. He also recorded four tackles on special teams. McCarty left the Labour Day Rematch early and was subsequently placed on the injured list. He returned for the final game of the season and the East Semi-Final. 2011: In 18 games (eight starts), McCarty recorded 52 carries for 209 yards, and 22 catches for 150 yards with one touchdown. He also had nine special teams tackles. McCarty saw action in the West Semi-Final, recording two special teams tackles, three catches for 17 yards and one carry for a one-yard touchdown. In the West Final, McCarty carried the ball once for six yards, hauled in two catches for four yards and recorded one special teams tackle. 2010: In 15 games (six starts), McCarty recorded 62 carries for 287 yards with three touchdowns and 36 catches for 278 yards with two touchdowns. He also had eight special teams tackles and one kick return for five yards. In Week 6, he caught a pass from punter Noel Prefontaine on a fake punt for a first down. In Weeks 8-9, he was placed on the 1-game injured list with a hand injury. McCarty was the Eskimos Most Outstanding Canadian. 2009: McCarty recorded 67 rushes for 348 yards with five touchdowns, hauled in 20 catches for 124 yards with two touchdowns and recorded seven special teams tackles. He earned Canadian Player of the Week in Week 4 and was named CFL Canadian Player of the Month for July. 2008: In 18 games (three starts), McCarty recorded 88 rushes with four touchdowns, hauled in 70 catches for 583 yards with one touchdown and 11 special teams tackles. He filled in when starting running back AJ Harris was injured on September 13 and earned CFL Canadian Player of the Week honours. McCarty got his first CFL start on October 4 against Winnipeg and again earned Top Canadian honours. 2007: In 18 games during his rookie season, McCarty recorded six carries for 13 yards, hauled in seven catches for 99 yards with one touchdown and recorded five special teams tackles. College: McCarty started the first seven games at Western Washington in 2006 before suffering a season-ending foot fracture. The Muskogee, OK native was a second-team North Central Conference All-Star and was ranked fifth among NCC rushing leaders with 492 yards and five touchdowns on 130 carries. He also caught 30 passes for 278 yards. He began his college career at Boise State before transferring to Reedley College (California) and finally to Western Washington. Personal: McCarty lettered in both football and basketball. Growing up he also played baseball. He represented Canada in the 2001 Big League World Series where the team placed third.